Disclosure: CraftProjectIdeas.com provided me with some of the supplies we used in this project. The ideas were entirely my own. There are Amazon Affiliate and other affiliate links in this article which means, at no additional cost to you, we could receive compensation for our recommendations. You can read our full disclosure policy on our Disclosure Page for more details. 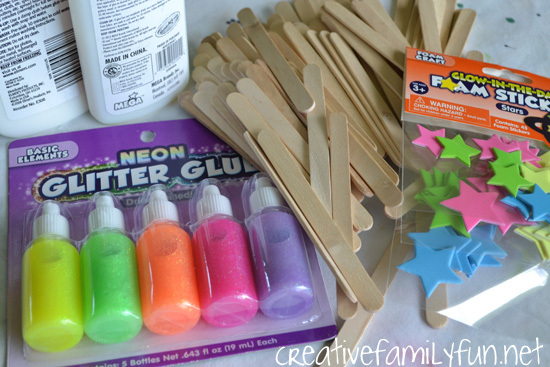 There are a few classic crafts that every kids should make at least once during their childhood. 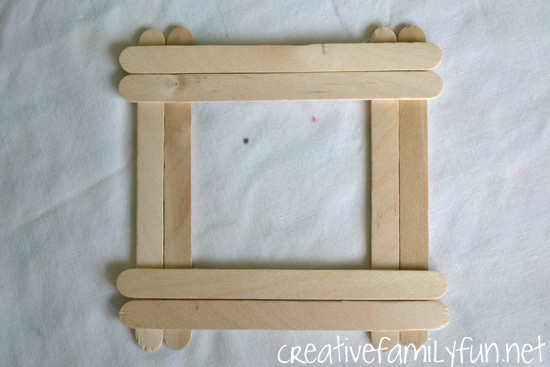 One of those classics is the craft stick picture frame. Did you make one of these when you were a kid? I know I made a few. In fact, my mom still has some of the frames I made. There are millions of ways to make these frames, but we opted for a double-wide version. We wanted plenty of room to get creative with our embellishments. Lay out two crafts sticks for the side, then layer two on top and two on bottom. Do not glue until you are satisfied with your arrangement. Once you are ready, use white glue on your corners to hold the craft sticks together. 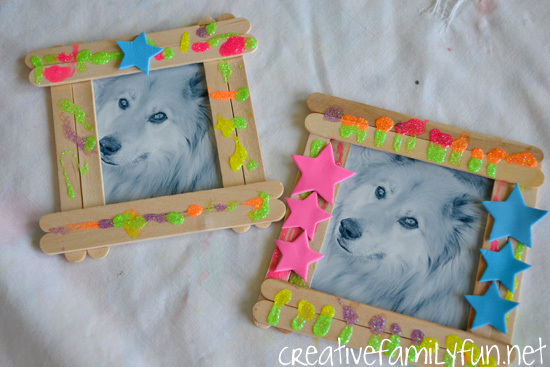 We used this fun neon glitter glue assortment from craftprojectideas.com to decorate our frames. We loved the glitter glue and have to say it was much better than other glitter glue we’ve used in the past. It was easy to squeeze and dried thicker and brighter. It was the perfect embellishment for our frames. We also added a few of these awesome glow-in-the-dark foam star stickers. When everything was dry, we added our photo. 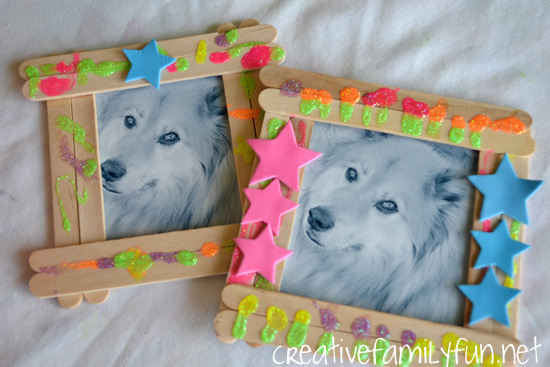 We’re using our frames to show off our pretty dog, Charlie. Isn’t he a handsome boy! To add a photo, just cut the picture to size and glue the overlapping edges to your frame. It’s that easy. Prop your frames up on a bookshelf or add a magnet to the back for a fabulous fridge decoration. 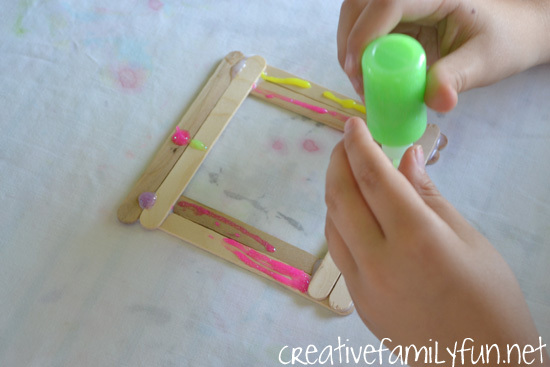 Have you ever made craft stick frames?